Potassium iodide is a crystalline salt and finds application mainly in the pharmaceutical industry. 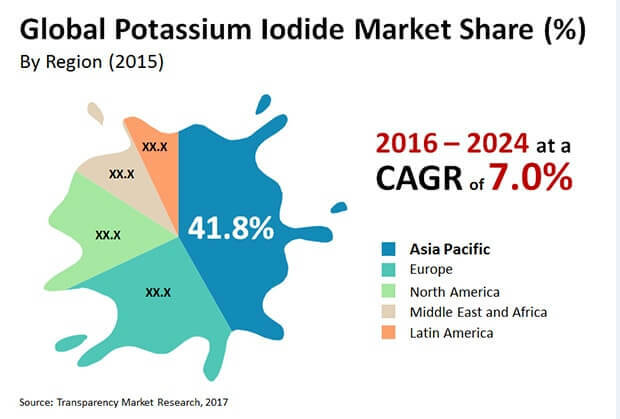 Owing to the rapid expansion of the pharmaceutical industry, on the back of a rise in health and wellness awareness programs and increasing population, the demand for several iodine compounds to make different pharmaceutical formulations has grown, thereby propelling the potassium iodide market. Emerging as one of the most commercially significant iodide compounds, the demand for potassium iodide also stems from the food and textile sectors. Growing health concerns and the rising demand for nutritional foods are factors promoting the use of potassium iodide. A diet that includes this iodine compound as a nutritional supplement is known to help prevent a slew of conditions such as hyperthyroidism, goiter, and cretinism. The US Food and Drug Administration (FDA) recommends the use of potassium iodide as a food additive for human consumption as well as a dietary supplement in animal feed. The global potassium iodide market was valued at US$607.9 mn in 2015 and is projected to reach US$1.14 bn by 2024, at a strong CAGR of 7.3 % therein. On the basis of end use, the global potassium iodide market has been segmented into pharmaceutical, x-ray contrast media, film photography, nutrition, and others such as the textile and chemical industries. Accounting for the dominant share in the market in 2015, the segment of x-ray contrast media has been driven by the continued use of potassium iodide in the food and beverages and pharmaceutical industries. Potassium iodide is used as an intravascular contrast medium for several imaging applications and techniques such as computed tomography (CT) and radiography. Iodine-based contrast media are used in radiology owing to their relatively harmless interaction with body tissues. Moreover, potassium iodide helps generate better-quality intravenous images for crystograms and pylograms. However, research analysts predict that this segment will lose market share in the coming years. The overall pharmaceutical sector is anticipated to gain traction as an end user over the course of the forecast period with the rising use of potassium iodide to treat various thyroid-related problems. Although potassium iodide has been used for film photography in the past, this end-use segment will exhibit little to no growth by 2024 owing to the popularity of and preference for digital photography. By way of geography, the global potassium iodide market has been divided into Asia Pacific, Europe, North America, Latin America, and the Middle East and Africa. Asia Pacific accounted for the dominant share in 2015 in terms of demand owing to the rapid growth of the food and beverages and pharmaceutical industries and a consistent rise in population in countries such as India and China. Europe is also a key market for potassium iodide, thanks to advancements in imaging technologies using x-rays and the expansion of the food and pharmaceutical sectors. Apart from this, recent progress made in industrial chemistry will support the potassium iodide market in Europe over the coming years. The growth of the North America market can be attributed to several preventive measures taken in response to nuclear radiation. The prevalence of iodine deficiency syndrome is a key factor driving the potassium iodide market in the Middle East and Africa, while the Latin America market is fueled by rising demand from the food, pharmaceutical, and health industries. Prominent vendors in the worldwide potassium iodide market include GODO SHIGEN Co., Ltd., Merck Millipore, Nippoh Chemicals Co., Ltd., Adani Pharmaceuticals, and Iofina Plc. Potassium iodide is a crystalline salt which is soluble in water and utilized mainly in the pharmaceutical industry. It is one of the most commercially significant iodide compounds with the demand from various industries such as pharmaceutical, food and textiles. Potassium iodide is mentioned in the World Health Organization’s List of Essential Medicines, the most important medication needed in a basic health system. It is a common commercial additive to table salt, in order to produce iodized salt, lack of which leads to health problems such as goiter and cretinism. Potassium iodide is employed mainly in the x-ray contrast media, pharmaceutical industry, food industry, textile industry and photographic film industries. Based on the end use industries, global potassium iodide market is segmented as X-ray contrast media, pharmaceutical, nutrition, film photography and others which include textile industry and chemical industry. Potassium iodide is used as an intravascular contrast medium for imaging applications. The X-ray contrast medium is used in the X-ray based imaging techniques such as computed tomography and radiography for enhancing the visibility of internal structures. The number of uses of potassium iodide in the pharmaceutical sector is higher than other sectors. Potassium iodide is used for thyroid-related problems such as thyroid storm and thyroid blockade. A healthy diet that contains potassium iodide as a nutritional supplement can prevent diseases such as goiter, hyperthyroidism, and cretinism caused by iodine deficiency. The report estimates and forecasts the potassium iodide market on the global, regional, and country levels. The study provides forecast between 2016 and 2024 based on volume (Tons) and revenue (US$ Mn) with 2015 as the base year. The report comprises an exhaustive value chain analysis for each of the end use segments. It provides a comprehensive view of the market. Value chain analysis also offers detailed information about value addition at each stage. The study includes drivers and restraints for the potassium iodide market along with their impact on demand during the forecast period. The study also provides key market indicators affecting the growth of the market. The report analyzes opportunities in the potassium iodide market on the global and regional level. Drivers, restraints, and opportunities mentioned in the report are justified through quantitative and qualitative data. These have been verified through primary and secondary resources. Furthermore, the report analyzes global average price trend analysis of potassium iodide end use industries. The report includes Porter’s Five Forces Model to determine the degree of competition in the potassium iodide market. The report comprises a qualitative write-up on market attractiveness analysis, wherein application and countries have been analyzed based on attractiveness for each region. Growth rate, market size, raw material availability, profit margin, impact strength, technology, competition, and other factors (such as environmental and legal) have been evaluated in order to derive the general attractiveness of the market. The report comprises price trend analysis for potassium iodide between 2016 and 2024. The study provides a comprehensive view of the potassium iodide market by dividing it into application and geography. The potassium iodide application segment has been segmented as X-Ray contrast media, pharmaceutical, nutrition, film photography and others. Application segments have been analyzed based on historic, present, and future trends, and the market has been estimated in terms of volume (Tons) and revenue (US$ Mn) between 2016 and 2024. The report covers detailed competitive outlook that includes market share and profiles of key players operating in the global market. Key players profiled in the report include Merck Millipore, GODO SHIGEN CO.,LTD, Adani Pharmaceuticals, NIPPOH CHEMICALS CO., LTD and Iofina Plc. Secondary research sources that were typically referred to include, but were not limited to company websites, financial reports, annual reports, investor presentations, broker reports, and SEC filings. Other sources such as internal and external proprietary databases, statistical databases and market reports, news articles, national government documents, and webcasts specific to companies operating in the market have also been referred for the report.